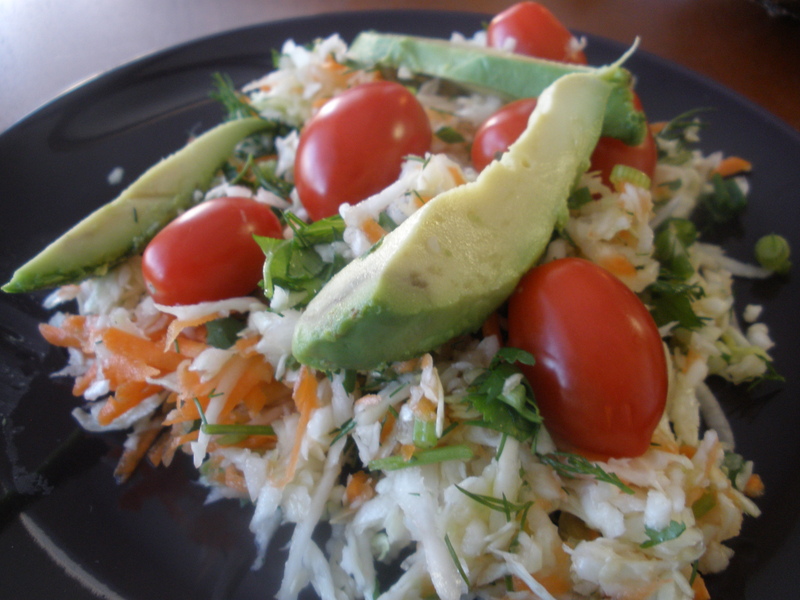 I make different variations of cabbage salad quite often. This latest version I made today based on ingredients I had around, including fresh dill, which I’d never used for this type of salad before. I tend to think of cabbage salads as going well with Latin food, and dill is not what I think of when I think of Latin food. I bought some at the farmers’ market yesterday to use for the borscht I plan to make sometime this week, but it’s really too much dill for one recipe. A tip I always give people about fresh herbs is to use them in salads. They really do add a lot of flavor. Here, I use cilantro and dill. Combine all ingredients. Add avocado upon serving. Do not add the avocado directly to the salad if you think you will have leftovers. Next, make the dressing. Add all ingredients in a bowl and whisk. Add to the salad and toss. Oh~ I love avocado!!! I just enjoy the way it lies on top of that salad!